Have you ever had a need to deploy some files to all of the virtual directories (every IIS site folder corresponding to a zone in the web app) for a SharePoint web application feature? After searching the interwebs high and low I was unable to find any information relating to this topic, so this might very well be one of the first publicly available. I want to say that getting this to work yesterday was one of the most fun development tasks I’ve done in awhile. Hopefully this can help someone else who is struggling with the same task or at least give you some fun things to try out. First the premise. 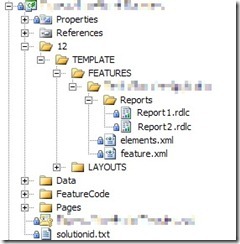 My client is hosting Reporting Services 2005 reports for a SharePoint custom application. The custom application lives in the Layouts folder of the 12 Hive. The reports will not be hosted on Reporting Services, but instead locally in the web application. Since the ReportViewer web control that will be displaying the reports only knows the virtual directory root (c:\inetpub\wwwroot\wss\VirtualDirectories\<port number of SharePoint zone>) we need a way to copy the files into that directory (and all other virtual directories for the web app meaning 3 zones in our environment) instead of residing in the 12 Hive. As such we wanted a clean solution for deploying these reports to the virtual directory folder that had the least amount of human intervention (ex. a batch command that ran XCOPY to copy the files into hardcoded folders would require human intervention beyond deploying the WSP file). 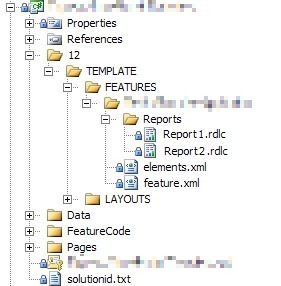 As with all SharePoint development solutions, I (under the pain of death) recommend wrapping them up as features and files inside of a WSP file. I don’t recommend building your WSP by hand as it is very tedious and there are some free tools that can help you immensely in this area. Currently I use either Visual Studio extensions for Windows SharePoint Services 1.2 (VSeWSS) or WSPBuilder. Each has it’s own set of pros and cons, but I’ll save that for another blog post. On this project we’re using WSPBuilder as the lead developer began using it and I’ve been grandfathered into it. (1) = Delete report files first as they are subject to source control and will be marked read-only. The copy method is unable to overwrite a read-only file even with the OverWrite boolean flag set to true. Here is a screenshot of the report files in the WSP project (pixelation on files done with Paint.Net, excellent free program I use all the time for image modifications similar to Photo Shop). For those with a super keen eye you might even be able to tell that I doctored the report file names as well, but that’ll be our little secret. Below is a slightly modified version (removing application name, client code, variable names, and other extraneous items) of the feature receiver code. As an added bonus, you’ll also see in the AddHttpHandlerVerb() method how another teammate developed a process to modify the web.config file of each virtual directory to allow the ReportViewer web control. I wish I could claim that as well, but sadly it was done by the time I joined the team. Here is a link to the below code: download code here. What I like about this solution is that it was developed in a short amount of time (hour or two to work out kinks), it is easily repeatable, and can be applied to other needs besides just Reporting Services reports. Please leave any feedback if you end up using this process, have suggestions to make it better, or have any other comments. Thanks and enjoy. After 6 months using the below method to deploy files to our development environments, it wasn’t until just recently that I noticed a fatal flaw in the below design: files are only deployed on the server from which the feature activate command is processed. In plain English, if you have 3 web front ends (WFEs) and you activate the feature on WFE1 then WFE1 will get the files, but WFE2 and WFE3 will not. 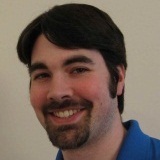 The solution to this problem was suggested by my new good friend Sean McDonough: deploy using a SharePoint timer job. I’m working on ironing out some of the changes for this and will have a new post on the matter once that’s complete. Look for a link to that post from here soon. Here is the link to the follow up post I mentioned above: Click here. After doing a little research and trying out timer jobs I found that a timer job was not the best solution for my situation. Instead I opted for a method of looping through the web front ends and doing a file copy directly to the servers. That same mechanism can be wrapped around the logic in this post so that files are copied to all web application folders on each web front end. Read more about it in that follow up post. How well does that solution hold up in a distirbuted environment? Because my feature is deployed to my farm through a WSP, that means it will automatically attempt to be distributed to all WFEs. We have deployed to environments with multiple WFEs already and seen the files existing on all WFEs. Check out http://www.sharepointnutsandbolts.com/2007/07/building-and-deploying-sharepoint.html (about 3rd paragraph down) for more info about WSPs deploying to all WFEs. Granted there is a slim chance that the distribution to all WFEs may fail due to an unforeseen error, but logging into Central Administration and checking the deployment status of your WSP will point out which server has an error. A simple retract and re-deploy typically corrects the error so long as it was only a deployment issue and not something wrong with your WSP. Thanks for the question, let me know if you have further questions. I tried this approach works really good. But the issue i am facing is that feature at webapplication level is not automatically getting activated. I have to manually activate it . Is this happening at your end too. You are correct that a web application feature will not get activated automatically. I'm not aware of a way to automatically activate features at that level. I'm in the process of writing up a series of posts on exporting a site template into a feature and automatically activating features at the site or web level, but that's the highest I've personally seen. Thanks for your feedback. But other applications also showing this feature when I check in the site collection features page. When I activate the feature ..I could see that respective master page in the master page dropdown..and when select it and go to home page ..saying unexpected error. It shouldn't show to all applications since I deployed to particular application. Did I do any mistake in my class or?? I just added empty class (intention is to get safe control tag in my manifest.xml and to apply web application level......and got after I add this simple class). Follow along the steps at the below link for adding your master page through a feature. Make sure it is scoped appropriately. Let me know if you have issues deploying. Hi I used your idea. my requirement is to update web.config file differently for NTLM and FBA. I first copied the web.config files into fetures folder and then doing a file copy from features folder to NTLM virtual directory folder and FBA as well. "Given Path's format is not supported"
Funny you mention that, at my current client we have the exact same issue of needing separate settings in the web.config file for NTLM and FBA. We're 99.1% of the way to that using the SharePoint APIs, but a few minor things that just can't be done. Sorry but How i can use this code? I'm not sure I understand your question. Can you be more specific? The purpose of this code is to give a sample of a feature receiver built using WSPBuilder. The feature receiver copies files out to the IIS website directories associated with our SharePoint web application on the web front end servers.